The name John Lennon immediately conjures up thoughts and images of the iconic sixties band 'The Beatles', the 'Let It Be' roof top concert, a pedestrian crossing at Abbey Road Studios, a white room, the song 'Imagine' and Yoko Ono. A whole generation was inspired by the words and music of the song 'Imagine', possibly the most remembered song from a generation that imagined there could be peace and good will between peoples and nations. It is also a song of possibilities for the future and in one or two hundred years humanity will still look back to acknowledge the man John Lennon, someone who inspired us to dream that all things are possible if we have the desire and intent to create our world. John in his own words was either going to be a street criminal or famous celebrity, it was a determination of will that took him out of the depressing streets of Liverpool to the heady life of 'The Beatles' and finally to New York. I grew up with 'The Beatles' but was never a follower of John Lennon and Sussan the host knew even less about this iconic figure of the sixties and seventies but please join us as John Lennon talks through the host Sussan from beyond the grave. This is a channeling of spirit which connects the entity who has passed over from the physical world to come through the host. John gives great insight into the world of his son Julian and leaves him a message, he also speaks freely about Yoko, his ever patient wife. He mentions a sinister side to his murder, going so far as to forward a reason. He speaks candidly about the changes he saw in his musical partner Paul McCartney. The book takes you on a journey, a journey to the other side of reality where all lives that have ever lived exist as an interactive recording which is able to be activated or switched on by the host. If you are considering the purchase of this book, please be aware it is transcripts of channeling sessions with John Lennon who has passed over. The connection is through a channeling psychic medium. The name John Lennon immediately conjures up thoughts and images of the iconic sixties band 'The Beatles', the 'Let It Be' roof top concert, a pedestrian crossing at Abbey Road Studios, a white room, the song 'Imagine' and Yoko Ono. A whole generation was inspired by the words and music of the song 'Imagine', possibly the most remembered song from a generation that imagined there could be peace and good will between peoples and nations. It is also a song of possibilities for the future and in one or two hundred years humanity will still look back to acknowledge the man John Lennon, someone who inspired us to dream that all things are possible if we have the desire and intent to create our world. John in his own words was either going to be a street criminal or famous celebrity, it was a determination of will that took him out of the depressing streets of Liverpool to the heady life of 'The Beatles' and finally to New York. I grew up with 'The Beatles' but was never a follower of John Lennon and Sussan the host knew even less about this iconic figure of the sixties and seventies but please join us as John Lennon talks through the host Sussan from beyond the grave. This is a channeling of spirit which connects the entity who has passed over from the physical world to come through the host. John gives great insight into the world of his son Julian and leaves him a message, he also speaks freely about Yoko, his ever patient wife. He mentions a sinister side to his murder, going so far as to forward a reason. He speaks candidly about the changes he saw in his musical partner Paul McCartney. The book takes you on a journey, a journey to the other side of reality where all lives that have ever lived exist as an interactive recording which is able to be activated or switched on by the host. Please join us today as we speak with John Lennon. 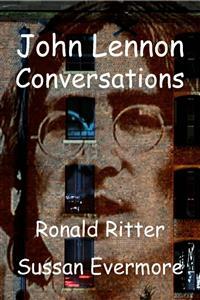 Ron asks: Do we have John Lennon? John answers: If I am available, (John says in a rather loveable dry humor). John continues: I like being here, I can feel the emotion of the host, thank you.